The beauty of flowers is seductive, but flowers, by their fleeting nature, are a fickle base to provide long-lasting gardens with year-round interest. Tackle this problem with the advice in Gardening with Foliage First. Learn how to first build a framework of foliage and then layer in flowers and other artistic elements to add the finishing touches. This simple, recipe-style approach to garden design features 127 combinations for both sunny and shady gardens that work for a variety of climates and garden challenges, including deer, dry shade, and more. Gardening with Foliage First has something for every gardener - beginners will learn how to choose the right foliage plants, experienced gardeners will be inspired by fresh twists on old favorites, and everyone will be encouraged to create a beautiful, year-round garden. 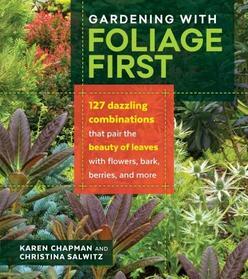 The highly visual guide shows home gardeners how to build a framework of attractive, long lasting foliage and then layer in flowers, berries, bark, and garden art for seasonal highlights.